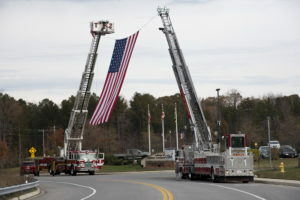 The panorama was reverent and festive as guests at the College of Southern Maryland’s (CSM) Annual Veterans Brunch drove one by one under a 20-by-30 American flag draped between the extended ladders of two local firetrucks. It was a fitting community welcome for the college’s veterans arriving to the Prince Frederick Campus to share a meal and hear from keynote speakers who paid tribute to their service. 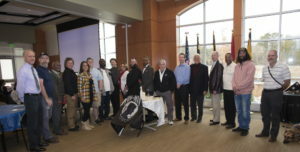 “It’s little surprise that within the state of Maryland, Southern Maryland has among the highest proportion of veterans when compared to its adult population within St. Mary’s, Charles and Calvert counties,” CSM Vice President of Operations Bill Comey told the attendees at the November 12 event. Comey, who was raised in an Army family, took a few moments to share his family’s lengthy military service. “My father served in the Army, as did his father; and his father and so on back to when the first Comey in America – David Comey – mustered out onto the Village Green in Lexington, Massachusetts to face the British Army,” he said. 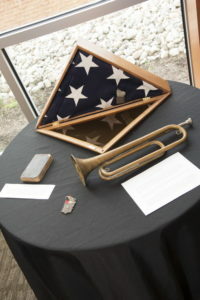 When Comey’s father died last year, he left several family relics to his sons, including a bugle, a prayer book, campaign medals and a flag, all of which Comey displayed for the attendees. “Reading these words – thoughts from a war-weary, but proud soldier on the battlefield longing for home – helps me imagine what many of you also experienced or felt while you served our nation,” he continued. “It helps me in some way to better appreciate the sacrifices you and your families made to keep America safe and protect the freedoms our nation enjoys. “On behalf of a grateful nation, please accept our appreciation for your honorable and faithful service,” he told the crowd before welcoming keynote speaker Maryland State Sen. Thomas “Mike” Miller. “On this day, we remember the freedoms we have because of our veterans,” said Miller, who encouraged the veterans in the room to engage with government. “We need you to follow up your service and continue to help our government,” he said, pointing out that veterans made great sacrifices to support the country’s ability to legislate. “My father was with Patton’s third Army, I grew up at an American Legion Post, and the very first bill I sponsored was the Veteran’s Cemetery bill,” Miller continued. A chorus of thanks were also delivered from Calvert County Commissioner-elect, CSM alumnus and Vietnam veteran Tim Hutchins, and State Senator-elect and U.S. Air Force Veteran Arthur Ellis. Huntingtown High School students performed at the brunch with a presentation of colors by the school’s NJROTC Color Guard followed by a moving acapella rendition of the national anthem by the Huntingtown High School Choir, under the direction of Choral Director Sandra Griese. Calvert County Fire Service Chaplain Larry Patin provided the invocation and CSM Student Veterans Organization (SVO) President Jeremy Foster guided the attendees through the ‘missing man and honor ceremony’ in remembrance of the nation’s prisoners of war and those missing in action. CSM’s commitment to veterans is reflected in numerous ways. The college is approved by the Department of Veterans Affairs (VA) and the Maryland Higher Education Commission, so that eligible veterans, servicepersons and certain dependents of veterans can receive VA educational benefits for credit certificate and associate degree programs as well as some Workforce Development programs. A lounge where student veterans can gather to study and socialize is available at the La Plata Campus and CSM has hired veterans affairs coordinators to advise students. Veterans are offered a 15 percent discount on tuition for individual fitness and pool memberships. CSM for the fourth consecutive year is honored to have earned the Military Friendly® School Designation from Victory Media for attracting and supporting student veterans and spouses who are transitioning from the military to civilian workforce. 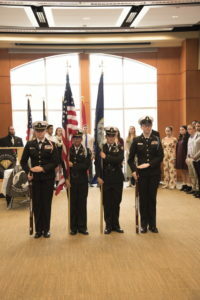 To learn more about CSM’s veteran and military support services, visit https://www.csmd.edu/student-services/veteran-military-support-services/. For photos from the program, visit https://csmphoto.zenfolio.com/18vetbfast. A letter to family written by Bernard Comey, 23, while serving as a Bugler in Company B, 2nd Massachusetts Regiment. Once more I have a chance to write to you since being kept from writing since we landed. I can’t tell you on paper [details about] any of the trip. I was well nearly all of the way and would have been so all the way, but for the terrible smell from the hold of the vessel where over 700 men were bunked. We are having almost all kinds of experiences, hunger, thirst, long marches, rain, fording streams waist deep nearly, and then camping down all wet with no chance to dry off. Talk of drinking dirty water, we mind nothing of it, we even drink muddy water, color of coffee and are glad to have that and lukewarm too. Well I have everything to be thankful for, I am well and safe after so much danger. We have had three engagements so far, the last, the battle of el Caney will go down in history. Old soldiers say it was more severe than the battle of Gettysburg, over ten per cent engaged were killed or wounded. Our clothes are in rags … our shoes are all worn out, we all have whiskers, and are black from the sun. You would not know any of us I believe. Tell Father I know what the hum and whistle of bullets is and heavy musketry as well as he [does now]. This entry was posted on December 6, 2018 at 10:01 am and is filed under All News, Anne Arundel News, Calvert News, Charles News, Community, County, Education, More News, Prince George's News, St. Mary's News, z 600X120 Top Ad Bottom, z 600X120 Top Ad Top. You can follow any responses to this entry through the RSS 2.0 feed.